The Commit to Kids Program Grant/Sponsorship Initiative - INVESTING IN ONE OF CANADA'S MOST PRECIOUS NATURAL RESOURCES, THE HUMAN-ANIMAL BOND. ﻿﻿﻿What's your organization doing to ensure your environment is safe and secure for the kids and youth you serve? Cultivating resources, knowledge, and strategies for keeping children and youth safe is critical to achieving the positive change child-serving organizations envision. Vulnerable Sector and Criminal Record Checks, however, are no longer sufficient when so much is at stake. As a result, The Canadian Foundation for Animal-Assisted Support Services (CFAS) is working with the Canadian Centre for Child Protection to provide grants and sponsorship to access the Commit to Kids program, which includes materials and online training to help your organization create a safe environment for children and youth. Developing a child protection code of conduct, a screening and hiring process, and a policy for reporting and addressing inappropriate staff/volunteer behaviour are critical measures made easier by materials from the Canadian Centre for Child Protection. The Centre has produced a step-by-step program that offers strategies to help reduce the risk of child sexual abuse in organizations. 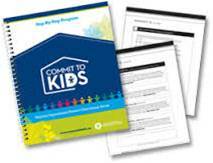 To learn more about the Commit to Kids Program or to apply for a grant or sponsorship to get started, please click on the embedded link below, or button at the top of the page.